Fig 1. ÄKTA pilot 600 bench-top chromatography system can be used in both GMP (“regulatory“ version) and non-GMP (“standard” version) environments. 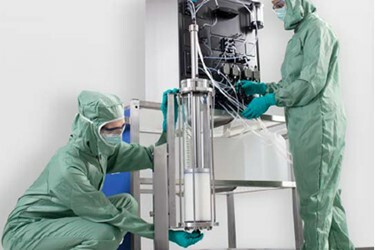 With the ever-increasing demand for a short time to market, solutions for fast and efficient process development and scaling are gaining interest in the bioprocessing industry. Due to the convenience, time, and cost; the development of a bioprocess is preferably conducted in small scale. The subsequent scale-up is thereafter performed in one or more steps, usually 20- to 30-fold per each step, depending on the final production scale. Equipment that can be adapted to the different stages of the development process facilitates this work. Although process economy is an important parameter; equipment providing simplified bioprocessing, a high level of automation, and compliance with GMP is required to ensure quality of the bioproduct. ÄKTA pilot 600 is a bench-top chromatography system suited for both GMP and non-GMP applications. Its wide pressure-flow range enables processing of technical batches, as well as small- and intermediate-scale production batches. The modular system design allows flexible exchange of functionalities depending on the requirements. This work demonstrates scaling and modification of a mAb capture step from the smaller HiScale 26 column operated on ÄKTA avant 150 to a larger AxiChrom 100 column operated on ÄKTA pilot 600. Furthermore, the scaled-up process was reconfigured and automated to fit a regulated environment.